A dietitian is a nutritionist with an advanced degree and experience treating a wide range of disorders. Treatment options include food, supplement and lifestyle changes. Your nutritionist in Brooklyn practices holistic nutrition, so he takes your entire life into consideration when making recommendations to improve your health. A dietitian nutritionist works closely with the other health care providers to supplement medical interventions and medications you may need. Note: Brooklyn Dietitians and nutritionists at Century Medical and Dental Center located in Downtown Brooklyn, Flatbush or Gravesend locations are accepting all major insurance plans including Medicare and Medicaid. A nutritionist is anyone who has an education in nutritional science. Many individuals learn about nutrition to complement and reinforce their other education and health care services — such as nurses, physician assistants or personal trainers. A registered dietitian, however, has a four-year degree in dietetics or nutritional science, after which she completed an accredited supervised practicum. A dietitian must pass a national exam to become a Registered Dietitian Nutritionist (RD). Your nutritionist in Brooklyn is an RD who followed a rigorous training schedule and adheres to continuing education requirements. Recently, with the population’s increased focus on holistic medicine, another certification group has come to the forefront. This group has created the title Holistic Nutritionist. The term defines a way of practicing medicine that takes into account the whole person — physical, mental, social and familial. A dietitian who practices holistic nutrition focuses on natural and organic foods. Additionally, holistic supplements are often incorporated into your daily routine and diet. A dietitian and a holistic nutritionist can help you focus on dealing with chronic health conditions as well. Concern over good health has given rise to collaborations with many other specialty medical practitioners. 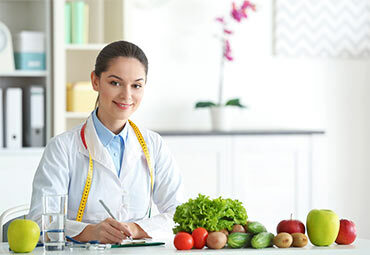 Many health care providers understand the positive benefits of conscious diet and exercise, and they’re willing to work with a dietitian nutritionist to serve their patients. Your dietitian nutritionist provides your family with advice for athletes, growing children, active adults and aging seniors. Expect guidance for nutritional support, diabetes education or renal nutrition, as necessary. As a part of the Century Medical and Dental group, your nutritionist in Brooklyn offers a variety of services, all of which can keep you healthy and at your peak. A Metabolic Assessment Profile or MAP is an accurate measurement of the oxygen and carbon dioxide production in your body. The measurements taken at rest and during increased intensity exercises indicate the efficiency with which your body processes and uses your stored energy. Weight reduction only occurs when you’re burning fatty acids and not glucose. Burning glucose only increases hunger. By assessing your oxygen output with special equipment that measures blood pressure, heart rate, inhaled and exhaled air and blood lactate, your dietitian can estimate the heart rate range that’s most efficient for burning fat. An exercise program that encourages this efficient ability to burn fat increases the chance for optimal weight reduction support. MAP testing can also indicate whether you’re eating enough of the right foods. It helps your nutritionist decide if you might need to look at any other underlying issues that could be hindering your weight loss goals such as thyroid, hormonal or insulin concerns. Your nutritionist in Brooklyn helps you tailor a plan that finds ways to cook simple, healthy meals for you and your family while being aware of schedule constraints and budgetary concerns. Integrative medicine includes not only annual physicals, vaccinations and normal laboratory testing for preventive measures, but also health, nutrition and diet. This health care path is being recognized as the most advantageous model for continued long-term health and disease management. Accessing all these available tools, dietitians and holistic nutritionists work closely to provide you with the best education and options for making your health goals a day-to-day reality.